Earlier this month Damon Albarn hinted at a Blur reunion, saying that he'd been "hanging out" with his old bandmate, guitarist Graham Coxon. Now it looks as though Albarn, Coxon and the rest of the gang will be doing more than just 'hanging out' in 2009. Before a scaled-down performance of his opera Monkey: Journey To The West for BBC Radio, Albarn was asked about the possible reunion, to which he said, "Blur are certainly going to rehearse and see if we're into it." 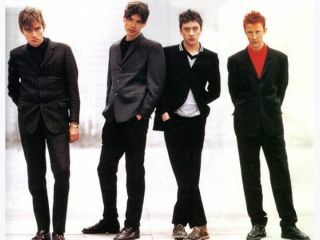 Since the band's last album, 2003's Think Tank, which was recorded without Coxon (he split the group a year earlier and contributed only one song to that disc), Damon Albarn has focused his energies on his massively successful virtual band Gorillaz (a new album is in the works for next year), plus projects such as The Good The Bad And The Queen and, yes, the Monkey opera. Graham Coxon, for his part, has released acclaimed solo albums like Happiness In Magazines and Love Travels At Illegal Speeds. He's also dabbled in literature, writing a foreward to a new edition of Herman Heese's Narcissus And Goldmund. In addition, he's part of a 'joint musical celebration' called Under One Sky that is currently touring. Plus, he's doing some recording with Pete Doherty. Busy boys, but at least they're talking again - and 'hanging out.' MusicRadar is hoping that Albarn and Coxon can make good on the hints and advances of recent years, and more importanty, find the time to make that rehearsal mean something. Could make for a good 2009.